Once Upon A Time Creators Preview Sunday's Episode "Dreamy"
If you’ve been following KSiteTV’s Once Upon A Time coverage, or if you follow Once news on the internet in general, you’ve likely already seen highlights from the Q&A we and other media outlets attended last week with Once creators Adam Horowitz and Edward Kitsis. Today we’d like to share a bit of what they had to say about Sunday night’s episode, “Dreamy.” The forum countdown is already open if you want to check that out, by the way. What we loved about this idea is we literally could write different tones, and different things, altogether. We wrote the Grumpy episode, and it’s a little lighter, it’s a little funnier, it’s a little sweeter. But we also wrote 18 with Regina, and that’s probably a little more emotionally wrenching and dark,” Kitsis explains. Guest starring in “Dreamy” is Angel’s Amy Acker as a fairy named Nova who helps to tell the story of how Grumpy became grumpy. The reference back in Episode 10 where Grumpy mentions that he was in love and there was a diamond involved will come into play here. Also making a return appearance is Emilie de Ravin as Belle, who first appeared on the series in the episode “Skin Deep.” “We love Emilie so much. We love what she’s done with the character, and we are excited to show you some more with her,” Adam Horowitz says. Edward Kitsis reveals that Belle has a “nice little scene” in Episode 14, where “she’s sitting up there with the person who loves her not realizing it, and that would be someone I would not want to piss off.” As for what’s next for Belle, Kitsis assures us that she will be back again, probably more toward the end of the season. The subject of Belle also brings up the question of if Belle being imprisoned in a psych ward was a reference to Emilie de Ravin’s character Claire in LOST, a show where Kitsis and Horowitz did a lot of good work. “I wouldn’t say it was so much of a nod as we felt really confident Emilie could pull it off,” Horowitz jokes. “We had the idea early in the season to have Belle being in the insane asylum, and then when we were talking about who would be the perfect Belle, because this has to be the person that is going to be sitting across from Rumplestiltskin and they have to – Belle is a strong character, and so we were like ‘oh it’s Emilie,’ and then we actually debated changing the ending because of the squirrel baby, and then we thought, ‘no, let’s surge. Squirrel baby again’,” Edward adds. “For us, there’s the fun of now playing them off as people who know each other and know their long history together,” Adam adds. 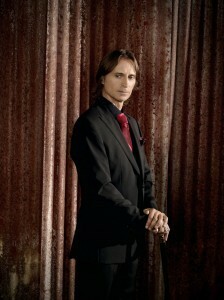 Kitsis describes Mr. Gold as a “complicated man.” “It depends where you line up with his interests. He has an agenda, and it’s whether you’re in the way of the agenda, or not in that agenda, and I think that a lot of these characters have gray areas,” he says. “There’s more to come with him this season. There’s an exploration of more about him and his son, and what happened there, that may hopefully shed a little more light,” Horowitz adds, telling us that we’ll be learning more in Episode 19. Don’t miss the “Dreamy” episode of Once Upon A Time – Sunday, March 4 on ABC! Take a look at some preview images here and thanks again to ABC for making this happen!